This winter my skin as been so so bad. I'm eating more chocolate and other unhealthy foods (I can't help it!) so I'm having loads of breakouts... mostly over my chin, which is a bit annoying. I'm pretty sure I can also put it down to letting my skincare routine lapse as of late, and also sleeping in my makeup a few nights. When my skin's been at it's best, I put it mainly down to my skincare routine, rather than healthy eating, although both contribute. Making sure you take off all your makeup before you go to bed is key. Whilst you're sleeping, your skin is able to repair and expel any oils (sebum) through your pores. With a layer of makeup almost acting like a plug to your pores, the natural oils cannot get out, and the bacteria in your skin and in the makeup seeps in, so the pores end up clogging and trapping the bacteria, which then creates the spot. This creates a whitehead. Blackheads come about when there is an opening in the pores develop and expose the melanin in the sebum to air, which causes it to turn black. But its the whiteheads that swell up, turn red and look like ready-to-explode volcanoes. That's what I'm having to deal with. I'm trying to wear make-up for as shorter time as possible so my skin can repair and breathe. To restore my face to its pre-christmas-pigout glory I'm back on my usual skincare routine, using a combination of various products, alternating for maximum results. These products include the Impulse Acne Treatment (a 3-step daily routine) and Bravura acid peels. No routine would be complete however with a facial cleansing brush like the Barefaced brush from Magnitone. As I have relatively sensitive skin, the normal brush that comes with the Magnitone Barefaced is quite abrasive on my face, particularly around the eye area. To get maximum use out of the brush, I trialled it with a range of different cleansers until I finally found one that not only worked with the brush, leaving it oil free after use, but also helped clear my spots! Upon first use, I was so surprised with how clean my face felt. 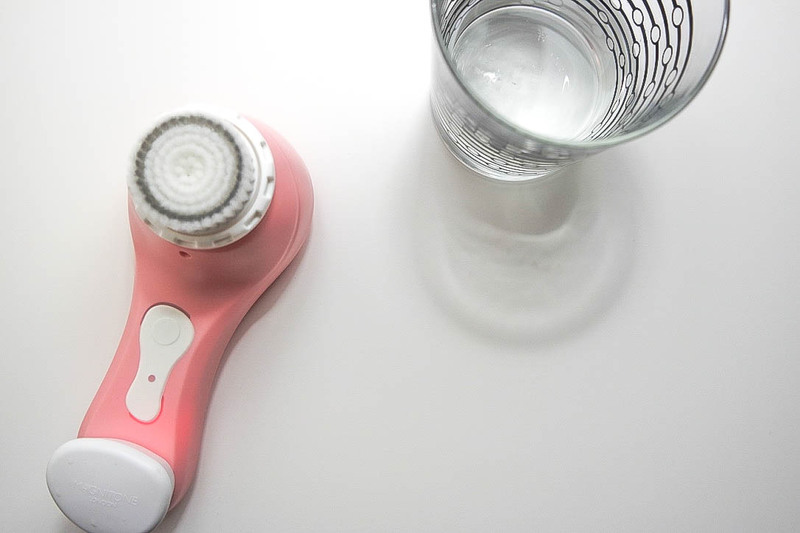 The two variations of vibrations and pulsations the Barefaced uses in order to clean deep into pores are super effective and really feel like they're doing their job. I was a bit confused at first, as the demonstration I'd had looked a lot different than how I was attempting to use it. I always feel that if there isn't a lather with the cleanser, then its not cleaning properly. This is not the case at all, so you really don't have to scrub it in with the brush, just simply glide it over the skin. This took me a while to figure out. After a couple uses, the brush would actually make the area around my eyes feel really sore, and the lovely girls at Magnitone so kindly sent me the Sensitive Skin brushes to try out instead. These were a vast improvement! The bristles were much longer and softer and just feel so nice on my face. The best things about the Barefaced is.. well firstly.. it's pink! But secondly, it's completely waterproof, so those mornings when you're panicking trying to get ready for work or uni, you don't have to wash and then wash and cleanse your face separately, you can do both in the shower/bath simultaneously! This also makes cleaning the cleansing brush a lot easier as you don't have to remove the brush head, you can just wash it under the tap. For this I do the same as I would for a make up brush using one of Dr. Bronner's Magic Soaps or Johnson's Baby Shampoo. You can see how Kirsty washes her brushes here. The first cleanser I tried with it was Pond's Cold Cream. This was a bit of a long shot if I'm honest. I doubted that this was the best thing to use, but I'd always had faith in my cold cream and trusted that this was the best make up remover/cleanser I owned. You can see my post on it here. This left the brush really oily and took ages for me to clean it off again. Never attempting that again. Secondly, was a bog standard face wash that I use in the shower. As good as this was building up a lather, it didn't make much difference to my skin and wasn't good at taking make up off either. I've come to the conclusion now that even though I would normally use a cleanser to remove my make up, when using the barefaced, make up should be removed separately beforehand, so as not to dirty the brush further. I use Garnier Skin Micellar Cleansing Water to remove my make up with a cotton pad. The cleansing brush with then remove any excess it is able to wash out of my pores. I was kindly sent the Impulse Acne Treatment 3-step skincare routine some time ago, and despite using it quite regularly, I never really attributed my complexion to it's use. But honestly, after using other products, I've still come back to it and I can now say that it makes my skin feel a lot cleaner and less greasy. Applying a walnut sized amount onto the wet Magnitone Barefaced cleansing brush, select the desired pulsing/vibrating mode and glide in circular motions across your face. Firstly over your first cheek, then the other and finally your forehead. Another great thing about the Magnitone is that it beeps when you've used it for 20 seconds. So I divide my face in thirds also and concentrate on each area for 20 seconds at a time. The device then switches itself off, ready to be rinsed. The second step is then a toning spray which you can either spray straight on as I do, or spray on a cotton pad and wipe over the face. The third step is then an acne targeting gel which is supposed to prevent further spots from appearing whilst removing the current ones. 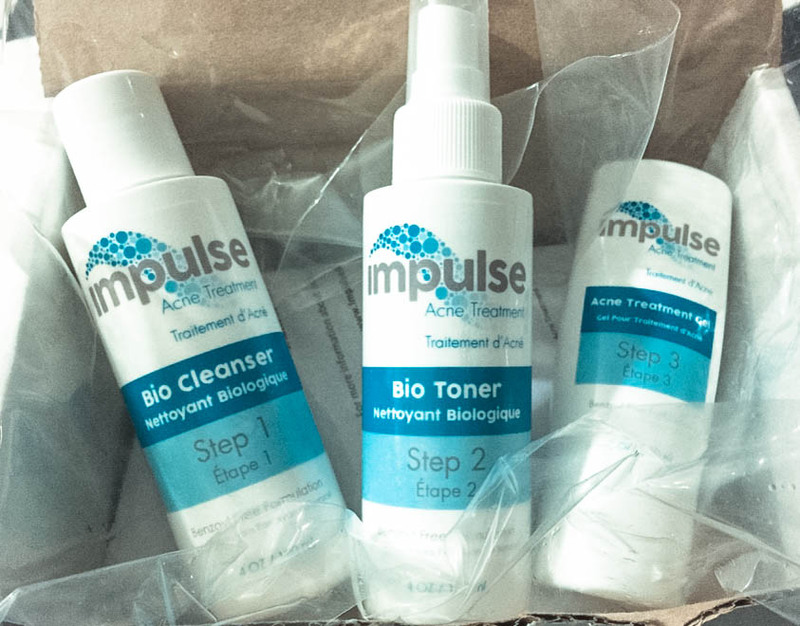 All of Impulse's products are Benzoyl Peroxide free (which appears in most leading acne treatments), which means no redness, swelling, stinging, burning or dryness and are really popular in Canada where they are from. Another Trio you could try is the Clinique Anti Blemish Solutions Set which you can read about here. After a few days back onto my routine, my skin is getting a lot better. But as it was getting pretty bad, I can see the products, and in particular, the cleansing brush bringing out all the impurities in my skin first before they go away completely. I'm at the 'it's got to get worse to get better' stage of acne treatment which always happens when you first start a new routine. I've just got to hang in there. But as this was working for me perfectly before I decided that I no longer wanted to fit into any of my clothes this Christmas, and just eat chocolate non-stop and sleep in my make up, I knew that this would be able to save me again! Combining this with an acid peel every other day using Bravura's products which will really dig deep into my pores and chuck out all the yuckies, I'll be there in no time! Have you tried the Magnitone Barefaced or the Impulse Acne Treatment? What did you think? I love how details this post is !!! The Magnitone also sounds fabulous ... And it is so pretty too! I am glad you have found something that works ! Good luck with your skin .. It is always SO annoying when your skin suddenly has a breakout ! Great post love!